The Big Sea: What I Know For Sure Thursday: We Were Meant To Have Life and To Have It Abundantly! What I Know For Sure Thursday: We Were Meant To Have Life and To Have It Abundantly! Now, it has taken me quite awhile, maybe as long as 40 plus years to actually realize that I can and is suppose to live an abundant life. Once I began to live what I know, and that is that God has given us dominion over everything on this earth, I began to live life and live life abundantly. 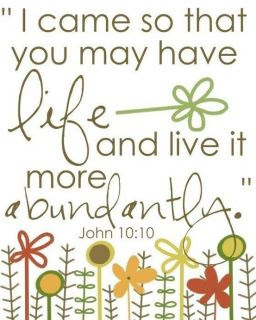 I know that many are asking what does it mean to live an "abundant life?" Well, for me, living an abundant life means to make sure that I live a life that honors God by doing things that I absolutely love to do with people whom I love. I believe that he wants us to enjoy the things that he has put on this earth for us and to do things that honor him like being a good person, taking good care of our bodies, having hobbies and doing them often, enjoying free time, and doing whatever else that may tickle our fancies and that honors him. 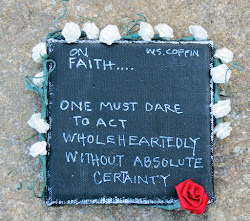 However, when we sit around and act in fear by telling ourselves what we can not do, I know, for sure, that we are keeping ourselves from living the abundant life that we are suppose to live. Doing strenuous work outs and eating things that are good for my body, definitely add to me living an abundant life. Because without good health, it is sometimes impossible to enjoy the things that God has put on this earth for us. I know for sure that I love people and being with great people adds to me living an abundant life. I also love taking care of one of my greatest gifts that God has given to me, my body. So, I have combined my love for people with my desire to take care of my temple, and this has added to my abundant life. I have met and formed incredible bonds with lots of people through my biking and running groups and working out with the greatest trainer in the world, Berhane. And these things make me feel so happy and fulfilled which lead to me living an abundant life. I love plays, and museums, and outdoor festivals, and I do these things often. Yea, when a play is on a Wednesday night, I use to think that maybe I should not go, because I would have to go to work the next day. Now, I put on my clothes and go and see a play on whatever night that I want to, and I still go to work the next day and perform to the top of my potential. I know that God does not want me to only enjoy this life on the weekends and during the summer, but I know that he wants me to enjoy my life everyday, year round, and I do. I have lived a super abundant life this summer. I have had days filled with activities and people whom I absolutely love. However, school started Monday, and it took me a day or so to get back into that school frame of mind, but once I put my school cap back on, my life became even more abundant. I absolutely love words, and I love to convey my love for words to my students. Today, I was working on my lessons for the novel Annie John by Jamaica Kincaid, and all I can say is that I felt an abundance of excitement and joy in my heart. I know that teaching literature is what God has called me to do, and teaching literature definitely adds to the abundant life that God wants me to live. For the commemorative March on Washington that was held on Saturday, I had to be very careful about choosing the person whom I would go to The March with. I've learned The Power of Now, and I was willing to go by myself before I went with someone who could not be in the moment. By that, I mean that I could not be with someone who complains, or was in a hurry, or someone who was not willing to see what the day would bring. And, God sent Adrian. Adrian is a fellow Tuskegee graduate, and Adrian loves life. The joy that he has is contagious, and he is the type of person whom I wanted to go to The March with. He sent me a text about hooking up to go to The March together, and we were together all day, being in the moment. We enjoyed the speakers, we walked to The King Memorial, we went to the Willard Hotel to take a picture with the wax statue of Dr. King, we caught a cab to have dinner and to see Dr. Cornell West, and not one time did either one of us complain; we were in the moment, and I know that being in the moment plays a huge part in living an abundant life. While doing a lot of walking and standing at The March, we talked about happiness. Adrian stated that happiness is priceless and that it is important to not let anyone steal our happiness. I've thought a lot about our conversation, and I know for sure that anything or anyone who is causing us not to be happy, is taking away from us living the abundant life that God wants us to live. It's been fun and real!